Olivia Newton-John Cancer & Wellness Centre (ONJC&WC) at the Austin Hospital run the Wellness Walk Charity Event, raising funds for the wellness programs provided to all cancer patients treated at the Centre. As with all charities, the main aim is to bring in as much money as possible from business and the wider community to support this much-needed facility. The Olivia Appeal Shareable App is a great representation of the ONJC&WC brand and complimented the campaign perfectly. 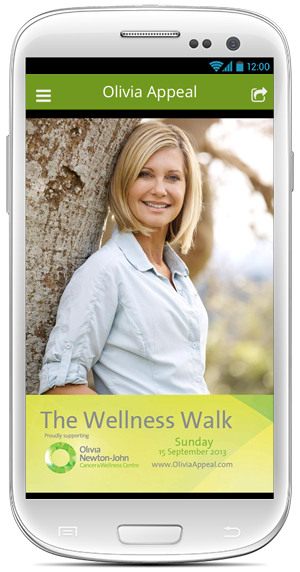 Users were able to register and donate through the app, find out more about the Wellness Walk, view the walk map and keep up to date with what was happening with the event on social media. You can create a Shareable App for your charity or cause simply and easily, right here in our app designer, for a lot less than you think, whatever industry you’re in. Sign up for your free account, login, call 13 SHARE (or +61 13 7427 outside Australia) or email support@shareableapps.com for more information.